WASHINGTON – For 32 years, Chicago has welcomed undocumented immigrants. The policy began with Mayor Harold Washington, who forbade local authorities from asking immigrants their legal status. Now, the city vows to continue his legacy and keep its “sanctuary city” title in the face of President Donald Trump’s executive order to cut funding to the 360 jurisdictions that have laws limiting their cooperation with federal immigration agencies. Illinois immigrant advocates say they will join the fight. Trump issued an executive order on Wednesday directing so-called “sanctuary cities” to cooperate with federal immigration authorities or lose federal grant money. The funding in jeopardy is federal grants related to law enforcement. “Sanctuary cities” are home to around 53 percent of the immigrant population living in the U.S. without legal permission, according to the Migration Policy Institute – a think tank that tracks the movement of populations worldwide. The cities include the five top destinations for all immigrants in the U.S. – New York, Los Angeles, Miami, Chicago and San Francisco, which accounted for just over 40 percent of the nation’s foreign-born population in 2010, according to a report by the U.N. International Organization for Migration. 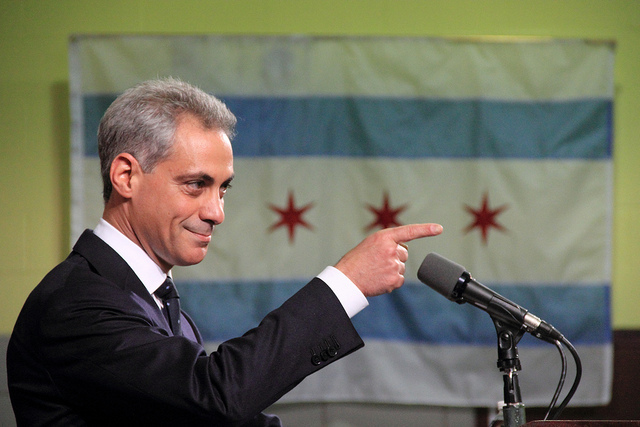 Chicago Mayor Rahm Emanuel vowed to defy the executive order even if the city loses the federal money. He declined to comment on the amount of funds Chicago stands to lose. Sheriff Mark Curran of Lake County, a wealthy suburban area north of Chicago that is not a sanctuary, criticized the funding cut for Chicago. The American Civil Liberties Union and other immigration rights groups likely will challenge the order in court, according to Illinois ACLU spokesman Ed Yohnka. He predicted that members of Congress also will try to overturn the order. For Yohnka, the idea of cutting off federal funding for law enforcement from major cities is simply unrealistic. “This is something that’s being done for showmanship,” he said. Fred Tsao, senior policy counsel at the Illinois Coalition for Immigrant and Refugee Rights, agreed with Yohnka. For Tsao, a stumbling block in implementing the order is the lack of a definition of a sanctuary city. He also questioned the feasibility of withdrawing federal funds, saying that the cities stand a good chance of winning a legal battle over the issue. New York Mayor Bill De Blasio has said his city will sue. Trump’s order is at odds with Chicago’s long history of attracting immigrants of all backgrounds, Tsao said. “This city has seen the wisdom of welcoming immigrants not just as residents of the city but also welcoming them to participate in city programs, including cooperating with local law enforcement,” he said.